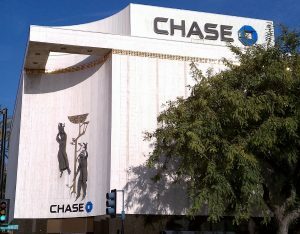 Love the site – I live in Torrance where I pass the old Home Savings and Loan (now Chase) building everyday. I have a little story. Almost 20 years ago, I was shopping with a friend in Pasadena. We went into a small antique store and were browsing (stuff was terribly overpriced, and we were younger and cheap) when the saleslady told us that there was a man upstairs who was selling some paintings because he was clearing the space. We went upstairs not expecting much (and not having much cash, we didn’t expect we could afford anything anyway) and there was a fellow repairing a light fixture in this vast upstairs area. All along the room were piles and piles of paintings leaned up against the wall. He looks at us and says “anything is $10 each”, so we each bought a painting. Later, I discovered on the frame in the back there was a little metal label with the Homes Savings and Loan logo with a registration number. I guess the whole lot was from one of the closed banks, probably in Pasadena. I have this lovely painting that I paid practically nothing for. Unfortunately, I don’t have the frame anymore…it was a horrid frame. 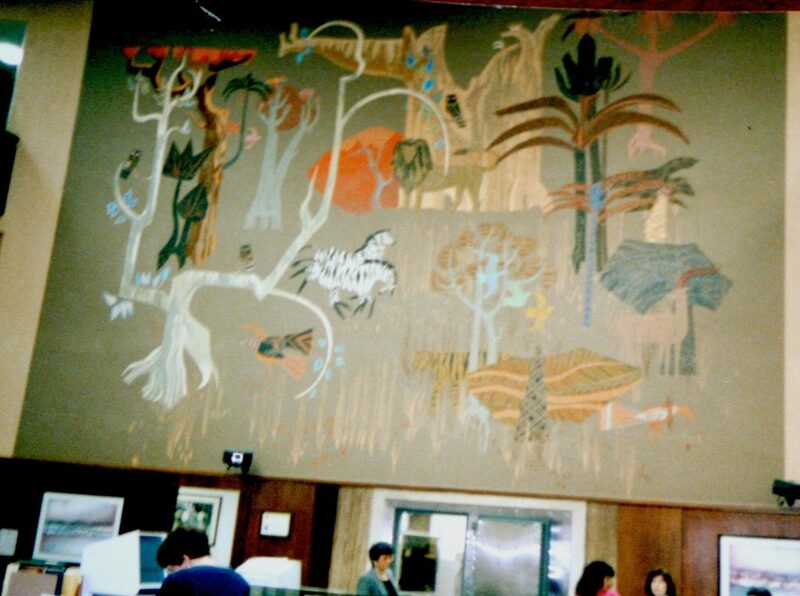 I miss the days banks had actual art on the walls. Interesting. What was in the artwork? Any signature? it is signed by a J. Baker…I haven’t found anything about the artist. It’s a landscape – trees, water, sailboats. 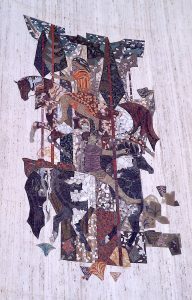 Looking forward to the Torrance day – and seeing both mosaics. I was an employee at HSA for over 25 years so when WAMU took over I left but I kept in touch with many former HSA folks and was able to obtain one of HSA big shield signs. It’s in my garage and I would be happy to donate it to a museum of HSA artwork if they want it. You can contact me at this email. Yes, the artwork is still hidden behind a false wall in the main lobby of the Burbank Branch. It is not a painting… It is a mosaic tile mural, made from thousands of individual ceramic tiles. One branch manager’s poor taste hid the mural over twenty-five years ago. One Chase Bank executive’s courage is all it would take to restore this historic piece of public art to the bank’s customers in Burbank and through the internet – to the world. Come on Chase Bank – this is not a difficult issue. To see my writing on the same subject, please visit http://www.jamesmcgillis.com/default.asp?id=53.